We love quinoa! It is such a versatile food and can be used to make breakfast, lunch, dinner dishes, desserts and any other dishes you can dream up. Quinoa originates from South America. Although it is referred to as a grain, it is really a seed that comes from a leafy plant. It comes in a variety of colours (white, red, black, purple) but the most common is white. 1. Rinse quinoa under cold water to remove saponins (some quinoa sold is already rinsed). 2. 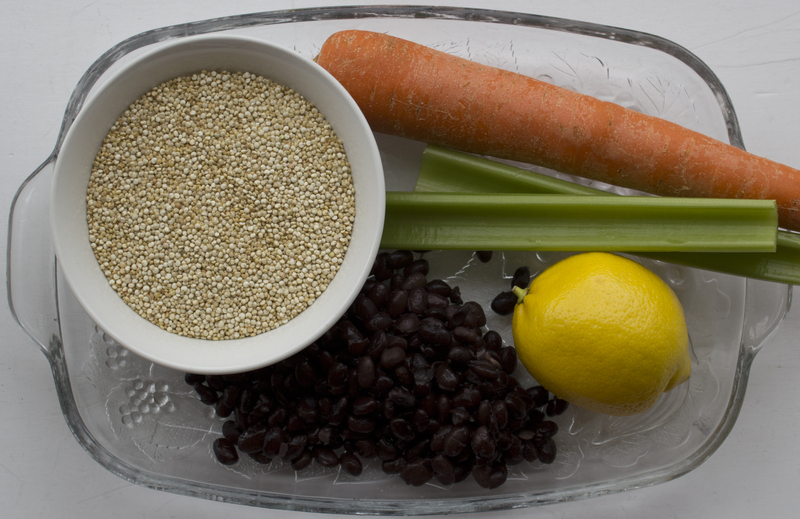 Place quinoa in a pot with 1 cup of cold water, bring to a boil, cover, simmer for 15 minutes, let rest for 5 minutes. 3. While quinoa is cooking, chop and/or slice celery, tomatoes, carrot, green onion and place in a bowl. 4. Add beans to vegetables. 5. Make dressing (see recipe below). 6. Add quinoa to vegetables. Add all ingredients into a mason jar and shake.